code.da.planet – Software development (AKA coding) is changing the world! I needed to increase the command timeout in DbUp from the default 30s to 10min and all examples that I found were in C#. If you want to use DbUp for database maintenance script automation check here. Reference article with C# timeout setting solution here. How to enable IIS Configuration Auditing with Command Line (tool)? IIS configuration auditing is a feature that would let you monitor the changes that are done to the IIS configuration store. It generates event messages (similar to those generated by enabling metabase auditing in the previous versions). It would display the configuration element which was changed, the user who initiated the change, and the original and the new value of the element. Wevtutil.exe is a Microsoft tool for modifying the EventLog. Have in mind that manual changes (with notepad for example) in the config files will not be detected and logged. I’ve tried to use knockout.js (KO) with bootstrap and I found that it will not work out of the box. The main reason – bootstrap will prevent the click events to go to knockoutjs. 1. How to notify KO about the click event without breaking bootstrap? 2. How to do KO data binding with the radio buttons? That solved the click event on the buttons. The answer for number 2: How to use knockoutjs to create dynamically the items (buttons) in my bootstrap radio button group? – It was harder for me – All examples were with static/predefined radio buttons. The solution came again from the KO documentation – I just did a careful modification of their example for the checkbox to a radio button. If you have any questions, feel free to use the comments section bellow. I’ve recently downloaded the new VisualStudio 2015 community edition on my MacBookPro and started enjoying all new features. I’m using Parallels virtual software to host my Windows 10. Both Win 10 and VS2015 are a really nice piece of software to use, but I found one very annoying problem – F12 did not work. I assume that you are a software developer – you know how often we are using F12, and I needed to right-click -> find declaration a lot. I knew that this is not VisualStudio problem and that most probably is some setting in my MacOS, so I’ve started digging. check "Use all F1,F2,etc. 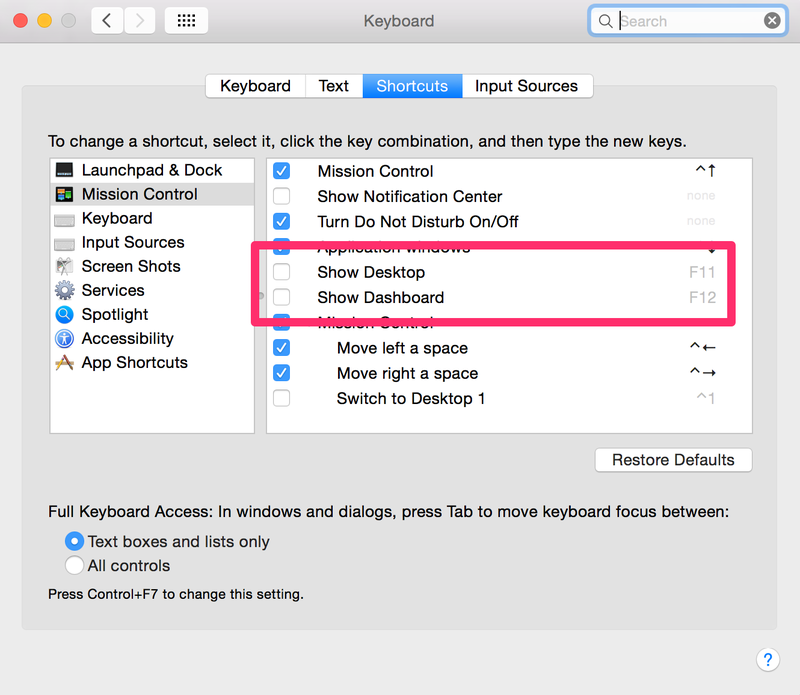 as standart function keys"
That disabled the usual Sound, brightness, etc. functionality on my Mac book pro but that’s OK with me – pressing fn +F1… will give me that back. 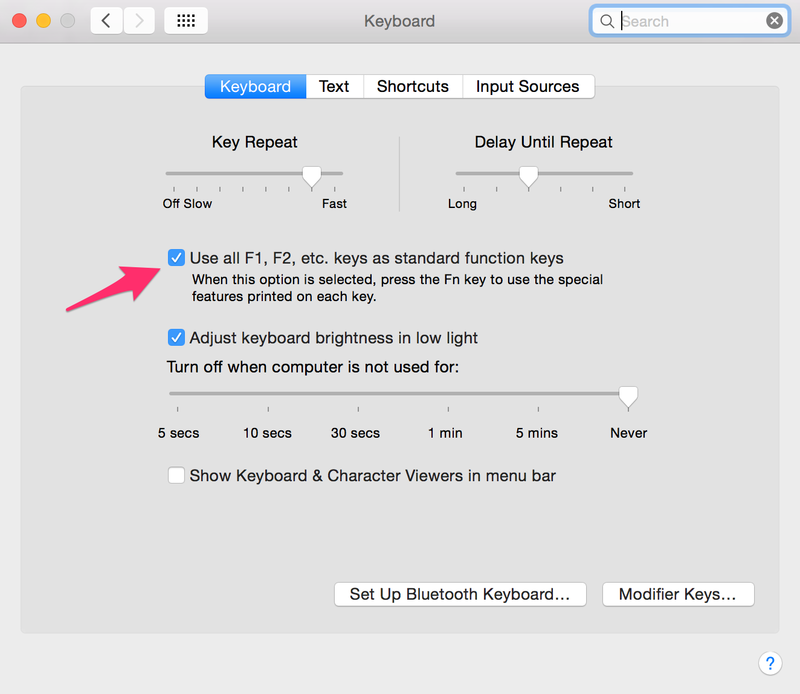 This setting helped for most of the F keys but not for F11, F12. unchecking them solved my problem. Now all my windows working habits are usable in my OSX. I hope this saves you time. P.S. As you probably noticed this will work for any version of visual studio or any software that uses F11, F12.